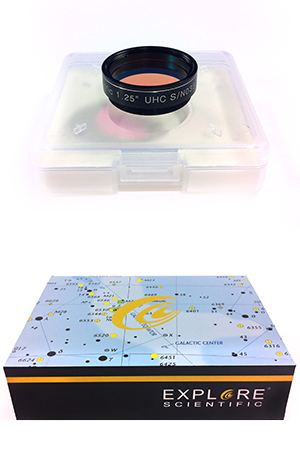 More versatile than the OIII filter, the Explore Scientific 1.25" UHC Nebula Filter will work on a broader range of nebulous objects, due to its dual peaks in transmissions on both broader OIII lines and Hydrogen wavelengths, whilst still providing ample suppression of common light pollution and related skyglow. Explore Scientific take pride in the individual serial numbering and testing of all their filters. When buying an Explore Scientific 1.25" UHC Nebula Filter, you will receive a unique test report, giving a wavelength graph of your individual filter.